Happy June! Summer is not quite officially here, but we are finished with school for the season. Hooray! 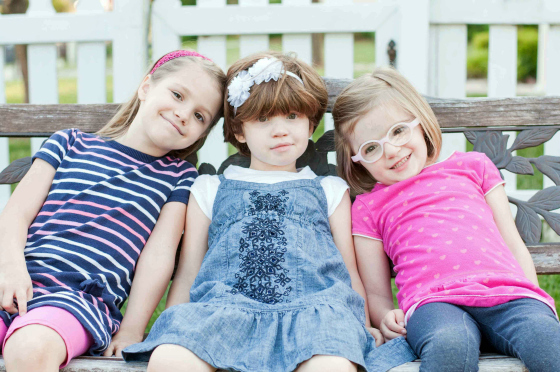 The approach of summer means many different things for us … More outdoor activities, little girls begging to go swimming, and (this year anyway) major haircuts for the girls and me. After growing out our hair for quite a while, Daisy, Sweet Pea, and I recently took off several inches each. But Ginger outdid us all with her chop of 10-12 inches, which she donated to Locks of Love. She is thrilled to be simplifying her hair grooming routine these days, and all our heads are feeling a bit more light and free. But this is not the only area in which we’ve been trimming back the overgrowth in our lives. Perhaps I’ve been bitten by the “spring cleaning” bug especially hard this year, but I’ve been noticing more and more corners – both literal and figurative – that are filled with useless clutter. Like an overgrown head of hair, these areas can get in the way and slow us down with all the extra time and care they take. They can prevent us from doing more of the things that are important to us. So, we are working on simplifying. 1) Getting rid of unused items. For my birthday one year, I asked only for one thing: that my husband watch the kids for the day so I could tackle my overfilled closet. I got rid of around half my clothes, most of which I never wore anymore. It felt SO GOOD! I think my closet is in need of another purge, but that’s still on the to-do list. This spring, we tackled the Toy Jungle. We had way too many toys in this house, y’all. And admittedly, I am most to blame. I love to bargain hunt, and I love to give my children gifts. But frankly, some of the things I’ve bought or kept are just junk, and there are many toys my kids rarely even touch. As the toy-cleaning battle has grown ever more daunting, I’ve finally started realizing that quality vs. quantity may be a better plan. The last time we went through their toys, we went about it the wrong way: we looked for things the girls wanted to get rid of. When you follow this approach, you tend not to think as clearly about what you will actually use on a regular basis. Instead, you think about what you might use at some point… which is a great way to keep almost everything. But when you look through to find what you want to keep, you start to see the things you truly value. Using this perspective, the girls were able to select a limited number of toys which they truly enjoy and play with often, and we had a trash bag full of things to sell or give away in no time. 2) Letting go of excessive memorabilia. Ahh, memories. Children are precious, and they make precious creations. But when these start taking over your living space, it’s time to intervene. At our house, the kitchen quickly becomes overloaded with arts and crafts. My girls fly through coloring books like nobody’s business and are constantly bringing home little projects from Sunday school which must be preserved. Some of these are skirted away behind little backs (and curiously never missed), but every so often it’s time for a real purge. My girls do this mostly by themselves. Any mostly-used coloring books are put in the trash pile, as are a large percentage of the drawings. 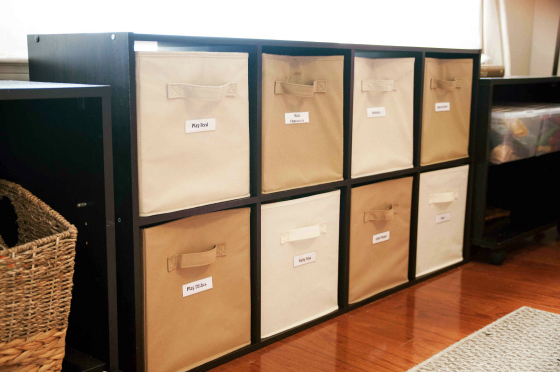 Uncolored books are kept for future use, and the more special drawings are stored in a filing cabinet. As a mother viewing my children’s creations, I’m sometimes tempted to keep more of these items. But then I think of the endless piles I’ll probably never look through again, and another dozen pictures head for the trash. Ahh, freedom. 3) Cutting back on careless spending. My husband has been listening to a lot of Dave Ramsey lately, so we’ve started trying to implement some of his strategies into our budget. We’re fairly frugal people overall, but sometimes we don’t keep very good track of things and end up spending on something unimportant (like junky toys, heh-heh) when we could be saving for something we want more. A budgeting sheet (we’re trying Ramsey’s EveryDollar program [link: www.everydollar.com]) helps us keep careless spending to a minimum. 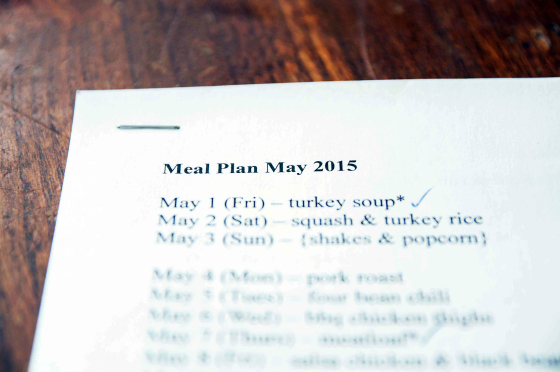 4) Planning meals ahead to minimize waste. 5) Being more intentional about our screen time. I grew up with time limits on video gaming. But for whatever reason (probably parental laziness), I haven’t been in the habit of placing these limits on my own children. We have rules about making sure their school and chores are finished before screen time, but beyond that, the limit is fairly arbitrary. The problem with this approach has been that our girls have no concept of how long they’ve been playing, and they feel entitled to keep going even when they’ve been at it for hours. So I’ve started implementing a time limit in order to help them keep track and give them more structure. I thought they might be disappointed when their time ran out sooner than usual, but they have been happier than ever! Now if only I could figure out a good way to impose this system on myself… ha! These are a few ways in which we are cutting back on the items and habits causing clutter in our lives. 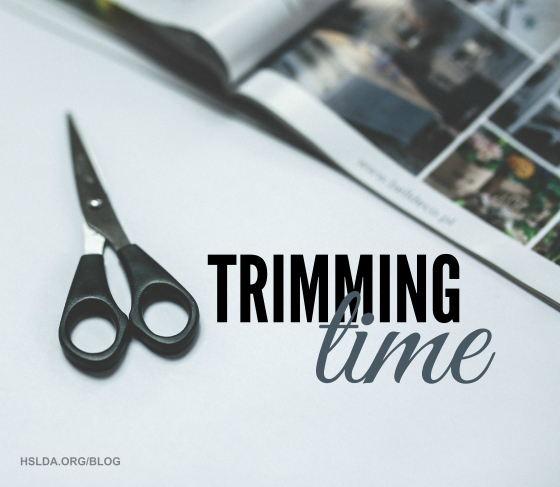 What are some ways you might use this summer to do some trimming?What are some of your favorite organizing or simplifying tips? Photo Credit: First photo via Pixabay, graphic design by Charity Klicka; second, third, and fourth photos taken by Jessica Cole, edited by Charity Klicka.